Be the first to share your favorite memory, photo or story of LeVerne. This memorial page is dedicated for family, friends and future generations to celebrate the life of their loved one. LeVerne was born October 25, 1926 in Minneapolis, Minnestoa to Peter and Pearl Westlin. At four years of age the family moved to Grandy, Minnesota, where she lived until she was thirteen years old at which time her mother died. She then moved to Minneapolis and lived with her Uncle and Aunt, Edward and Alice Westlin. LeVerne attended grade school in Grandy and then Patrick Henry Junior and Senior High Schools in Minneapolis. She was then employed at Northwestern Bank as a book keeper. LeVerne was confirmed at Bethlehem Lutheran Church in North Minneapolis, where she was united in holy marriage to jack Berry on June 10, 1949. They then moved to Moline, Illinois, where her husband attended Augustana Lutheran Seminary. 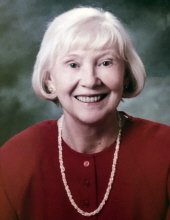 LeVerne was employed at the Augustana Book Concern as a secretary until 1953. She worked as a bank teller in Brockton, Massachusetts, the year her husband served his internship. They moved to East Hampton, Connecticut in 1953, then to the southwest side of Chicago in 1957, then to Downer’s Grove in 1965, both in Illinois. In 1971 she moved to Fremont, Nebraska. LeVerne was always very active in her church. At Bethlehem Lutheran in East Hampton, she taught Sunday School, sang in the choir, made robes for the choir, volunteered as the church secretary among many other things. While in Chicago, she continued the same active service at Calvary Lutheran on the southwest side and Gloria Dei Lutheran in Downers Grove. She served as vice president and then president of the five thousand member Women’s Auxiliary of the Lutheran Council of Greater Chicago. In Fremont, LeVerne was very active in Salem Lutheran Church teaching Sunday School, Vacation Church School, the catechetical program, Lutheran Church Women, volunteered occasionally as church secretary, and for many years as leader of the Monday evening adult Bible study. In addition to her service in the church, she served as grandma at Dodge County Head Start, as a docent at the May Museum, a member of the Women’s Auxiliary and Red Cross at the Fremont Hospital. She was employed for a number of years in the office of Schweser’s Department store. Survived by her husband the Rev. Dr. J.W. Berry; son Paul Berry of Indianopolis, Indiana; daughter Christine Marie (Carlyn) Solomon of San Clemente, California; granddaughter Krystal of Omaha, Nebraska; great-granddaughters Diana and Isabella, Myla Martindale; three step grandchildren Jessica (Kyle) Martindale, Julia Solomon, Jerod (Laura) Solomon; sister-in-law Marva Jackson of Minneapolis, Minnesota. Preceded in death by her parents Peter and Pearl Westlin. Visitation: 5:00 - 7:00 PM, Monday, April 15, 2019, at Dugan Funeral Chapel. Funeral Services: 10:30 AM, Tuesday, April 16, 2019, at Salem Lutheran Church. Pastor Shari Schwedhelm will be officiating. To send flowers or a remembrance gift to the family of LeVerne Helen Berry, please visit our Tribute Store. Burial to follow service at Ridge Cemetery. "Email Address" would like to share the life celebration of LeVerne Helen Berry. Click on the "link" to go to share a favorite memory or leave a condolence message for the family.